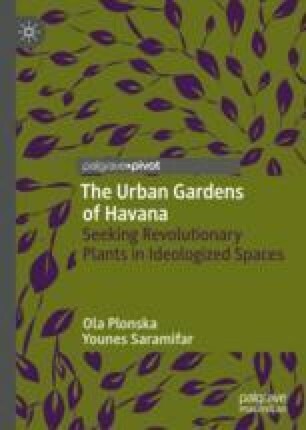 Welcoming, absorbing, intriguing, bonding and unique spaces: the small-scale urban gardens of central Havana play a fundamental role in our ethnographic stories. In this chapter we introduce the urban garden to emphasize the poetics of gardening through our personal engagement with the gardeners and how they inhabit these spaces. We began our anthropological journey by way of ethnographic gardening and remained open to unexpected changes, the irregular or the indefinite. Our open approach was not only to remain creative in our anthropological craft but to adjust our methods to the challenges of the research environment. We narrate everyday life (the micro perspective) under the authoritative Cuban state through the lived/living experiences of urban gardeners. These experiences are not ‘thick descriptions’ that are linked to larger political issues but rhizomatic observations that highlight the relationships between human and non-humans within the natureculture debate. Holbraad, M. (2018). ‘I have been formed in this revolution’: Revolution as infrastructure, and the people it creates in Cuba. The Journal of Latin American and Caribbean Anthropology. https://doi.org/10.1111/jlca.12344.